Filed to: Gahhh!Filed to: Gahhh! 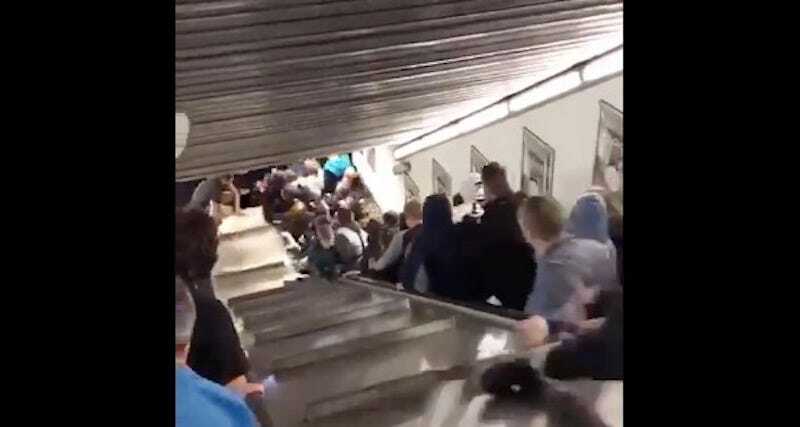 A warning: If you are going to find yourself on a crowded escalator or staircase at some point today and are prone to fits of anxiety, you should probably not watch this video from a metro station in Rome. This happened before yesterday’s Champions League match between Roma and CSKA Moscow. The accident reportedly injured 24 CSKA fans who were on their way to the match, and one of them is in serious condition. It’s still not clear what caused the elevator to malfunction, but Roman authorities are investigating.